Last year we took a hard look at GivingPress and realized some things needed to change. We tried to make it everything to every organization in need of a website. The result was an overwhelming amount of options, integrations and feature creep — most of which were unnecessary. As a result, we have removed the bloat and made the experience much better for new users. GivingPress makes the process of starting a nonprofit website easy, and it just got easier. In 2009 we founded the WordPress theme company, Organic Themes. For the past eight years we have been creating professional themes for a market of designers and developers with an existing knowledge of WordPress. We know how to reach that market. However, GivingPress is primarily a website provider for nonprofit organizations. WordPress is just a cog in our website machine. We’re often targeting organizations that have never heard of WordPress — much less used the software. It’s a different market for us. A mistake was made. We thought WordPress was easy enough for new users. Some customers began providing feedback that it was too complicated. So, we listened. Then we watched as novice WordPress users fumbled through the software. They were overwhelmed by the options. Starting a nonprofit website should be easier! The goal is to provide organizations with a website so easy to use that it doesn’t require a learning curve. Because they should be focused on their cause, not learning new software. So I started re-building the GivingPress experience. Starting a nonprofit website can be a daunting task for newbies. GivingPress makes it easy with our new nonprofit website builder. We have wrapped up all the steps of starting a website into a simple and pretty package. Despite the simplicity, your GivingPress website can be infinitely extended, and the website and content are 100% yours! Need to export your database? No problem. Need SFTP access to website files? You got it. Need eCommerce on your website? Piece of cake. Don’t have any idea what I’m talking about? Don’t worry about it! Take a look at the GivingPress website builder. We’re confident it will exceed the needs of your nonprofit website. The default WordPress admin experience. The new GivingPress admin experience. Although GivingPress harnesses all the power of the WordPress platform, the admin experience is unrecognizable as WordPress for our website customers. We have removed the confusion and simplified the website building experience. So, even if your organization has never heard of WordPress, you can build a nonprofit website with ease using GivingPress. If you’re a WordPress power user — don’t worry! All the familiar settings and features are still under the hood. Nearly all your website options are found in the Site Builder. Create pages, blog posts, team members and sections of your website all within the Site Builder, and watch your changes take place in real-time. Within the GivingPress nonprofit website builder you can add your organization logo, change layouts, colors, content, menus and so much more! The process is simple and intuitive. So you don’t need to be a designer or developer to make quick changes to your site. All this talk is getting old. Why don’t you try it for yourself, right now! There are absolutely no fees or obligations. We have a sandbox site for potential customers that want to test the platform. Go wild! Create new pages, add team members, change the colors, images, content and more. 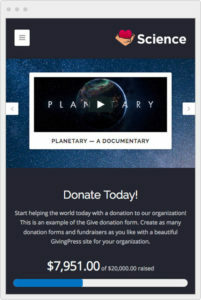 Get a feel for using a GivingPress website. Don’t worry — all your changes will be wiped out after 15 minutes. A big part of the GivingPress experience is provided by the powerful GivingPress Pro theme. After many years of designing and developing themes for businesses and nonprofit organizations, we set out to create the ultimate WordPress theme for nonprofits. Previously, the theme was only available to GivingPress website users. By popular request, we recently made the GivingPress Pro theme available for purchase on our site. If you already have web hosting and WordPress, the GivingPress Pro theme is an excellent solution for starting a nonprofit website. GivingPress Pro is packed with features and integrations specific to the needs of nonprofits. Below are some recent improvements to the already impressive list of features. A responsive design is paramount for any professional website today. It means that your site will adapt and be accessible on any device or screen size. With the growing percentage of mobile and tablet users browsing the web, having a responsive website for your nonprofit is crucial to capturing donations. In addition, Google positively impacts the search rankings of responsive websites — and negatively impacts non-responsive websites. The GivingPress Pro theme has always been responsive. However, we made several tweaks to the responsive design for a sleeker experience on any screen. Perhaps the biggest update to the GivingPress Pro theme are the new custom widgets. The new widgets allow users to create team profiles, subpage sections, featured content sections and simple donations throughout your site. The use of these custom widgets greatly enhances the flexibility of the theme. Now, users can achieve an endless arrangement of layouts. The Featured Content Widget displays an image, title, summary and link of an existing page or custom content. It’s a useful widget for displaying brief information or guiding website users to various sections of your website. The Subpage Section Widget is extremely versatile. It allows for any existing page or custom content to be displayed as a full section on the home page. You can stack as many subpage sections on top of each other as you desire. Also, the sections can easily be organized by dragging and dropping them into position. The Simple Donation Widget is used for linking to an external donation service such as PayPal. It’s perfect for organizations that already have an existing donation service, and are not ready to start accepting donations on-site. The Profile Widget is used to display member and volunteer profiles for your organization. Display an image, name, title, summary and social media links for as many profiles as you like. The Team Section Widget displays all team members that have been added to the organization in a clean 4-column layout. In addition, a background image can be added to the widget. Our goal with GivingPress is to simplify the process of starting a nonprofit website. Implementing WordPress starter content into the GivingPress Pro theme is another step towards simplification. Starter content was recently introduced with the release of WordPress 4.7. Finally, it has provided a standardized way of adding demo content to new WordPress installations. The starter content in the GivingPress Pro theme provides optional sample pages, widgets, menus and theme settings to get new users started. The content can easily be modified or removed to suit the needs of your organization. We have implemented licensing in the latest version GivingPress Pro for receiving ongoing updates. 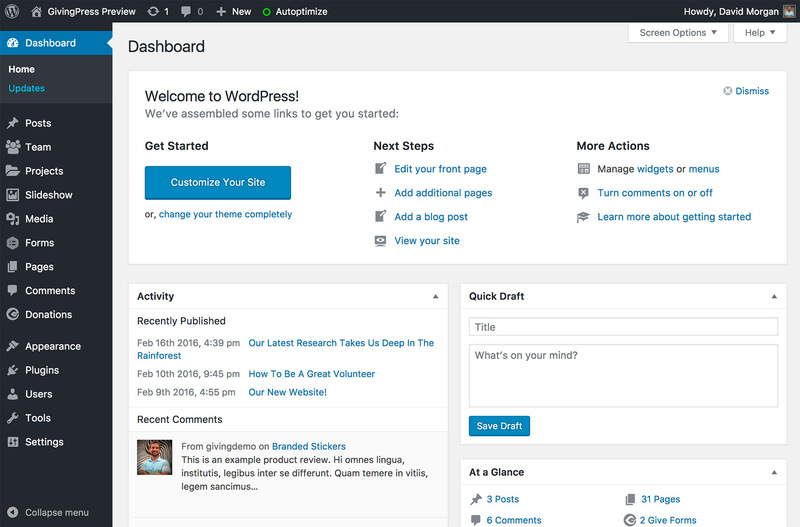 So any new version release can easily be applied from within the WordPress dashboard. As upgrades are made to the theme, we want you to have them! Hosting is essential to starting a nonprofit website. With GivingPress hosting, your organization will be up and running with a basic nonprofit website in a matter of seconds. Hosting accounts are setup in the Amazon Web Services (AWS) cloud environment, each with WordPress and a theme already installed. It’s an affordable solution for any organization that isn’t ready to commit to the full website builder experience. Check out the full list of features and pricing options here. GivingPress hosting manages all software and security updates on your server. So you don’t have to worry about your site becoming susceptible to attacks and malware. In addition, our hosting boasts 99% uptime, high-speed bandwidth and daily backups all hosted within the AWS cloud. With GivingPress, you own all of your website and content, and we help make sure you won’t lose it. Whether your organization is in need of a new website, WordPress theme, hosting or website services — GivingPress has a solution. Take a look around, and don’t hesitate to contact us with any questions. We are committed to helping organizations start a nonprofit website!